This is a walkthrough for the adult edition of qureate’s NekoMiko visual novel, available over at Steam. 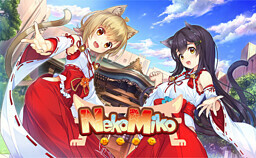 Featuring 2 catgirl mikos (shrine maidens) that come to rid you of your misfortunes. The 2 heroines in NekoMiko are called Ayame and Kaede. There’s a total of 4 different endings available, and with this guide you’ll be able to unlock all CGs as well. You’ll need only 2 save slots. This guide assumes you have the free adult edition patch (R18) installed. Ayame… Can I ask you?